The Bernician has performed more than 300 gigs on the stand-up comedy circuit; written and staged two critically acclaimed London plays; taught stand-up to a giggle of fledgling comics who went on to professional careers; co-produced and co-directed a critically acclaimed 35mm short film; and played supporting roles in mainstream and independent film and television productions; in addition to co-producing and marketing a #1 hit Danish action comedy and directing his debut feature film, Nefarious, which is slated for its long-awaited release in 2019. The Bernician went on to draft the first legal argument by a lay advocate to be established as a point of UK law; as well as creating and publishing free online content that has had more than 1,000,000 downloads; whilst co-producing, editing and directing his second feature film, The Great British Mortgage Swindle, which was released in the UK on 10/11/2018. The Bernician is also a recalcitrant philosopher, a revisionist historian, the draftsman of the first Anarcho-National Treaty and a Great Charter for the 21st Century. Born within sight of the River Tyne in the spring of 1969, on a day when a fire-breathing comet struck Britain and turned the skies red, The Bernician spent his first nineteen years North of the Wall, before heading south in search of creative plunder, belly laughs and true love. Following a ten-night, sold-out run of his one-man show, Dad Wouldn't Mend My Tractor, at the Euro-Theatre Festival in France, where one French critic described it as "the language of universal comedy", he established himself on the London comedy circuit in August 1991. During his first three months on the comedy circuit, The Bernician was described by The Heckler magazine as "one to watch for the future", having gone on a run of storming gigs, sharing bills with award-winning comics Lee Evans, Bill Bailey, Jenny Eclair, Jerry Sadowitz, Phil Jupitus, John Thompson and Eddie Izzard, to name but a few. In 1995, The Bernician wrote his first London play, The Truth Game, a snappy contemporary comedy about three couples lying to themselves and each other, which became an overnight fringe success and was described by the Blackheath Guide as "an unexpected treasure." 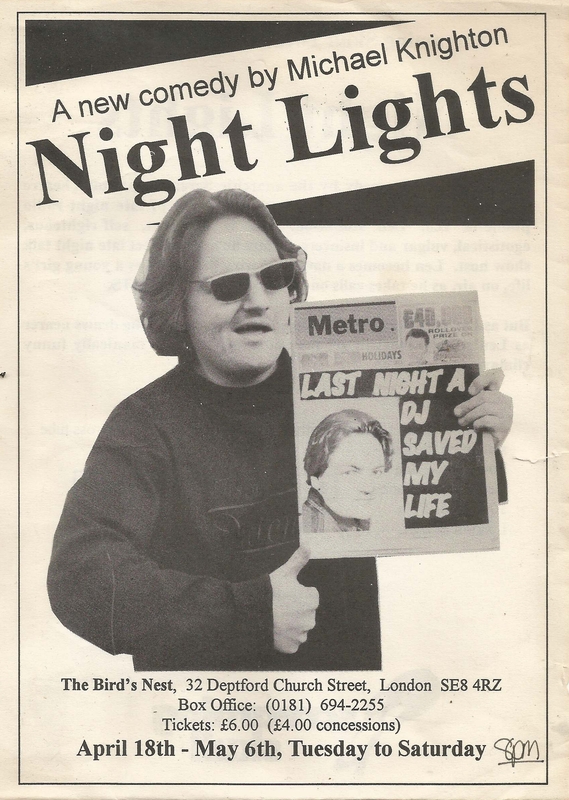 The Bernician then wrote and starred in Nightlights, a play about a narcissistic late-night radio talk show host, which also played to full houses in London, after Time Out described it as "a skillful light satire." 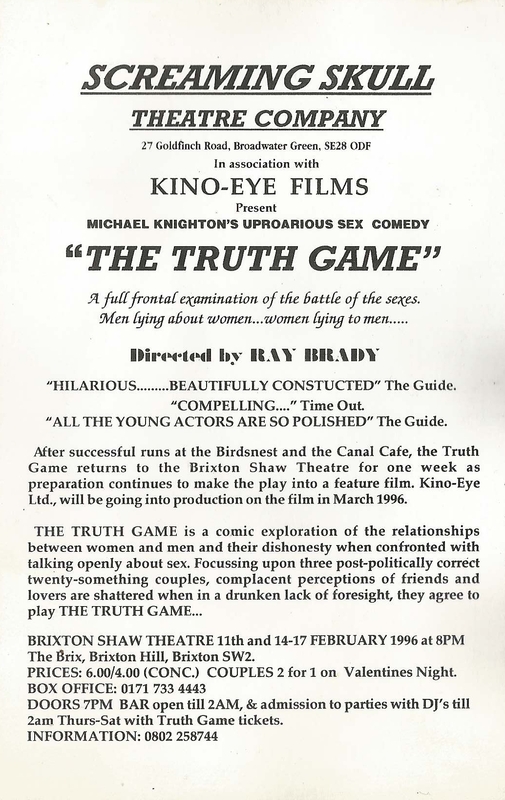 The Truth Game enjoyed several sell-out runs at theatres across London and The Bernician was commissioned to develop it into a screenplay by Kino-Eye Films, which led to his induction into the guerrilla film industry and the first of nine trips to the Cannes Festival in May 1996. In the autumn of 1996, The Bernician performed his character-based, surreal and political stand-up in Ray Brady's Little England for Kino-Eye Films, which was eventually broadcast on Channel 4 in 1999. In 1998, The Bernician co-produced and co-directed the 35mm fifteen minute black comedy, Roadkill, starring the late Brian Hibbard [pictured above], which was described by Total Film as "hilarious" and "beautifully shot" and was broadcast on Sky Moviemax in 2000, following popular screenings at the Cardiff, Leeds and Raindance film festivals. From 1998 to 2001, The Bernician's stand-up workshops in London and the south east nurtured numerous national new comic award-winners and professional comedians, including Markus Birdman, Mark Dolan, Stephen Carlin, Patrick Monahan, Steve Williams and Josie Long. In 2000, The Bernician was cast in a supporting role in the 1st episode of Randall & Hopkirk (Deceased), starring Vic Reeves and Bob Mortimer, as an oddball workman, playing opposite Jessica Stevenson. The episode was directed by Game of Thrones director, Mark Mylod. In August 2001, The Bernician was commissioned to write a historical television drama series called Geordie Boys, about three generations of Newcastle United fans and the players they idolised. The ten episode series is still in development and is partially based upon his own family. In 2004, The Bernician co-produced the hit Danish action comedy, The Good Cop, starring Kim Bodnia and Game of Thrones star, Nicolaj Coster-Waldau, which his company, Unspeakably Wicked Pictures, launched at the Cannes Market whilst the film was #1 at the domestic box office. The Bernician shot his directorial debut feature, Nefarious, also starring Danish legend, Kim Bodnia, alongside newcomers, Conor Woodman, Spek, Shaoron Percy and Guy Porritt, and Dutch stars, Alwein Tulner, Tygo Gernandt, Willy van der Griendt, Kenan Raven, Johnny Melville and the late Antonie Kamerling, in the spring of 2005. The film is currently being remastered for its long-awaited international release in 2019. From autumn 2009 until autumn 2018, The Bernician and co-producer, Michael O'Deira, spent nine years making a coruscating documentary feature film called The Great British Mortgage Swindle, which was released in the UK on the 10th of November 2018. The Great British Mortgage Swindle is written and narrated by The Bernician, who also appears in the film during footage of a talk he gave on mortgage fraud in Stony Stratford during the summer of 2011. 1. The men who founded BIS were working for or with the House of Rothschild when they founded the bank. 2. The governors of the central banks which became members of the BIS board of directors were working for or with the House of Rothschild in their financial policy-making. 3. The House of Rothschild has benefited, whether directly or indirectly, from any aspect of the business conducted by BIS. In TGBMS, we propose that the only remedy capable of righting the myriad of wrongdoings committed by government officers and the judiciary is a Grand Jury's unilateral declaration annulling their purported jurisdiction to carry out their crimes against the people. However, we could argue all day about which remedy will put right the wrongdoings of bankster-controlled criminal government, but only one remedy will set aside all the potential conflicts that could so easily divide and conquer those who must stand under one united cause in our millions, if we are to have any realistic chance of garnering enough grass-roots support for radical and urgent change in Britain. The following is a damning account of a what I was told by the ex-wife of “Kissinger’s right-hand man”, during numerous conversations over course of several months, from the 14th of September 2001 until May the following year. She asked me to choose the right moment to make her story public, but she also insisted that I should not release the information until I had checked every aspect of it in order to be certain of its validity. More than 12 years after the last time we spoke, I have realised that the world is finally ready to hear her terrifyingly prescient inside story, behind the curtain of the aristocratic genocidal construction which became instantly known as “9/11”. True love is not a curse, a spell or a potion. Nor is it transient, fickle or bereft of devotion. Nor is it foolish, messianic or narcissistic. Lifetime after lifetime, for whom the belle tolls.